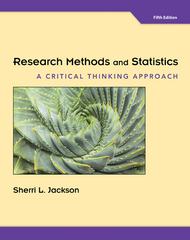 Research Methods and Statistics 5 Edition RESEARCH METHODS AND STATISTICS: A CRITICAL THINKING APPROACH, 5th Edition, successfully illustrates the integration between statistics and research methods by demonstrating the ways to use statistics in analyzing data collected during research. This combined book adopts an inviting narrative style that speaks directly to readers and draws them into the material, helping them overcome the initial apprehension they may feel at the prospect of learning both subject areas at once. Focusing on the logic of the process and the methodology aspect of research, Jackson incorporates a friendly critical-thinking approach and presents examples and exercises to which readers can relate.